I hate tofu. That’s been my knee-jerk response pretty much since tasting it the first time and every time I had it after. It wasn’t so much that it had no flavor—nothing really not to like about that; what’s not to like about nothing?—it was rather the lack of flavor combined with its curdy texture. I remember talking with Michael Symon in his restaurant Lola in Cleveland when he was trying to come up with a vegetarian or vegan dish to put on the menu that used tofu. “I don’t know,” he said. “I hate tofu.” And that was that. No tofu on the Lola menu. 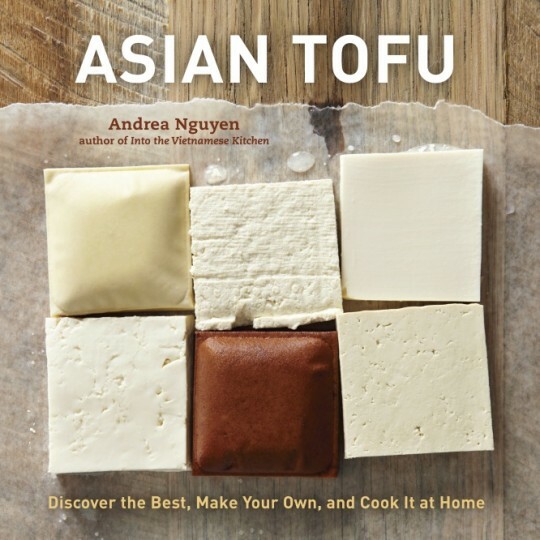 So when Andrea Nguyen, a cook and writer whom I met at the Greenbrier food writers’ symposium and whom I admire for her intelligence and clean writing, told me she was doing an entire book on tofu, I thought she was crazy. She told me she was going to show me, as in, I’ll show you. Well, she did—sent me not only the gorgeous book Asian Tofu, but also soybeans and coagulants to make my own tofu. This was a lot of fun and not much different from making basic cheeses like ricotta and mozzarella. You bring pureed soybeans to a simmer, add a coagulant and strain out the liquid, then press the curd. She asked me to try one of her favorite recipes, spicy tofu with beef and Sichuan peppercorns—“the first tofu dish I fell in love with,” she writes in her book. It’s a basic stir-fry, so once you have your mise en place set up, the dish comes together in minutes. It’s a deeply fragrant and pungent dish, because of the peppercorns. I used the optional pork rather than beef. The dish was indeed excellent, but here is what’s important about it to me: I’d used a third of the meat I’d have used in a stir-fry without tofu, and yet the dish was every bit as satisfying to a meat-loving tofu-hater as if it had had 100% meat. This is a big deal. Tofu is too easily linked exclusively to vegetarian and vegan cuisine, which unfairly pigeonholes the versatile protein. We live at a time when for both health and ecological reasons, we ought to rely less on meat, eat less of it. Tofu, it turns out, is a fabulous strategy for eating less meat without feeling the difference. And with the spicy sauce, it even tricked me into liking the tofu itself! OK, Andrea, you did it. And I thank you. Spicy Tofu with Beef and Sichuan Peppercorn. Photo by Donna Turner Ruhlman. This is the first tofu dish that I fell in love with. I was a teenager and my dad let me tag along to a Chinese restaurant lunch with him and his friend, Mr. Li. As the adults chatted, I quietly ate up most of this heady Sichuan specialty. The soft tofu and ground meat swimming in a velvety, spicy, unctuous sauce was addictively good. Later, as I was cooking my way through Chinese cookbooks, I realized that the memorable dish was called ma po dou fu. It was among the first Chinese recipes I mastered and is one I still regularly make today. During my visit to Chengdu, I realized how elastic this classic can be. At traditional Sichuan restaurants, it’s numbingly hot with a layer of red oil floating on top. Zhong Yi’s aunts and uncle favored pork over beef and omitted the chile bean sauce, opting instead for a huge dose of tingly Sichuan peppercorn. When I queried Chef Yu Bo of Yu’s Family Kitchen about the key elements of ma po dou fu, he responded in his thunderous Sichuan voice, “Dou fu, niu rou, Pixian dou ban jiang!” (Tofu, beef, Pixian chile bean sauce!). To make his point, he took my friends and me to visit an artisanal sauce producer in Pixian. Below is my rendition, which provides lots of room for experimentation. Use whichever meat you like, though beef’s hearty flavor pairs well with the spicy rich sauce. Add fermented black beans for savory funk and chile flakes for heat. Cut the tofu into 1/2-inch cubes and put into a bowl. Bring a kettle of water to a rolling boil. Turn off the heat and when the boiling subsides, pour water over the tofu to cover. Set aside for 15 minutes. Meanwhile, measure out 1 1/3 cups of water (the stuff you just boiled is fine) and set aside near the stove. You’ll be using it later for the sauce. In a large wok or skillet, toast the peppercorn over medium heat for 2 to 3 minutes, until richly fragrant and slightly darkened; you may see a wisp of smoke. Let it cool briefly, then pound with a mortar and pestle or grind in a spice grinder. Set aside. Drain the tofu in a strainer or colander and put it near the stove. As with all stir-fries, assemble your ingredients next to the stove. Heat the oil in the wok or skillet over high heat. Add the beef, stirring and mashing into small pieces until crumbly and cooked through, about 2 minutes. Add the ginger, chile flakes, fermented black beans, and chile sauce. Cook for about 2 minutes, stirring constantly, until the beef is a rich reddish-brown color and the chile sauce has turned the oil slightly red. Add the sugar and soy sauce, stir to combine, then add the tofu. Gently stir or give the wok a shake to combine without breaking up the tofu much. Pour in the 1 1/3 cups water you set aside earlier. Bring to a vigorous simmer, and cook for about 3 minutes to allow the tofu to absorb the flavors of the sauce. Taste the sauce and add a pinch of salt or sugar, if needed. Add the green onion and stir to combine. Give the cornstarch one last stir, then pour enough into the wok to thicken the sauce. You may not need to use it all. In Sichuan, the sauce is more soupy than gravylike. Sprinkle in the ground peppercorn, give the mixture one last stir to incorporate, then transfer to a shallow bowl. Serve immediately with lots of hot rice. My recent post Staple Meal: Stir-Fry. Use tofu to make a vegetarian Pad Thai, a popular Thai noodle dish. Iron Chef Morimoto’s restaurants in Philadelphia, NYC, and Napa. The Tofu Project connects leading entrepreneurs, innovators, and business leaders from Japan and the United States through curated events designed to bring Japanese creativity to a global scale. Andrea’s other books: Into the Vietnamese Kitchen: Treasured Foodways, Modern Flavors and Asian Dumplings: Mastering Gyoza, Spring Rolls, Samosas, and More. Just like any great ingredient, it can be ruined. I still remember the first time I tried Tofutti “ice cream.” That took a long time to get over. Fortunately, my wife makes delicious tofu dishes and I’ve been inspired to cook with it since. Funny, I was having breakfast at a stall in Hoi An Vietnam last Sunday -it was like a buffet-at-a street stall where you buy a plate for $1.50 and fill it up with what ever you like – and one of the dishes ofered was braised pork belly with mustard greens and tofu. I laughed to myself when I thought how parochial we are as a culture, pigeon-holing this stuff as a deprivation for vegans instead of an augmentation of deliciousness. Suffice it to say, it was really good. Michael, were you in the market in Hoi An? There are some fabulous eats there and the vendors are well skilled. Tofu got a bad wrap in the US. With folks traveling to Asia and eating/cooking more Asian food, things are changing. There’s room for tofu in most diets. Pork bell and tofu make nice friends. OK so now here is the challenge, make tofu sausage(in a casing) that tastes good. Just kidding I really like tofu but, like you, it took me time to warm up to it and learn how to cook with it. oh yeah, I have been wanting this book badly and after looking at the recipe I am ordering it today. Awesome Tom. Let me know your thoughts. While I was living in Japan, I fell in love with tofu- having previously hated it. Even cold silky tofu with soy sauce, ginger, scallions and bonito- which sounded appalling to me, turned out to be one of the most refreshing summer dishes available. There was a particular variety of firm tofu made in the region I was living that I still crave today. They also had a pressed and smoked variety that I miss greatly. Good stuff when made and used right, to be sure! I like the idea of tofu as a complement to meat instead of a replacement. Tofu is quite flexible and I like to use it, but as a straight up substitution it can be a disappointment. For example once I ordered a milkshake and got a tofu “milkshake” and you can bet I noticed the difference IMMEDIATELY. It was not for the better. I’ve been using tofu for years, we would buy it from a tofu factory in Northeast DC – 10lbs for $3.50 in a bucket. It lasts about a week if you change the water daily. My children ate it without issue as toddlers, especially with mild peanut sauce. my first instinct when I saw the pictures of the various tofu’s was that the bottom row center was a chocolate covered firm tofu. I don’t think it was but I wonder if one takes a hard tofu, presses the liquid for a while and then pours a ganache or dips it completely in chocolate…what would it taste like? I am going to try it with a sweet chocolate. The tofu you’re thinking of was firmly pressed then simmered in soy sauce and other seasonings to give it that chocolatey coating. Finally, it’s baked to dry out the coating a bit. Pressed seasoned tofu is a savory that’s often sliced and stir-fried. If you make it yourself, you can even tea smoke it in a wok. Or, season it with lemongrass, chiles, etc. There’s still a bit of moisture in the stuff so you’d have to dry it out more before dipping in chocolate. Not a bad idea. 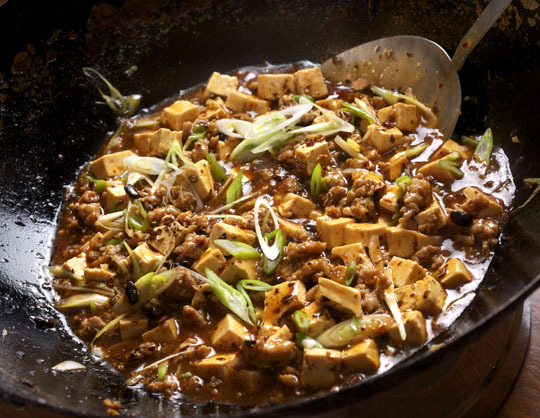 Mapo tofu is among my wife’s favorite dishes. A local (Philadelphia) Szechuan place called Han Dynasty introduced us to the dish a couple of years ago, and it’s rapidly become a go-to takeout dish. Looking forward to making my own. Thanks! For an eye-opening tofu experience — in fact a vegan one — you could try going to Kajitsu in New York City. It’s cheap compared to most fine dining and certainly most sushi restaurants around NY, and the food is unlike anything I’ve had elsewhere. Tofu is prominent, of course, but also this weird wheat gluten gloop. The flavors are subtle but not absent and I dug the Zen aspect of the whole experience. My point is that while I agree that tofu shines in flavorful, even meaty, preparations like mapodofu, it has flavor and identity unto itself. You’re absolutely right, Sam. The NY restaurant probably gets super fresh tofu, which develops a certain umami after a it’s made. Season it with a little soy or even salt, and it’s yowza good. There’s a Japanese silken tofu and rich soy milk hot pot recipe in Asian Tofu is the ultimate expression of that umami goodness. I had it in Tokyo and had to replicate at home. I felt the same way about tofu until I lived in Tokyo. Tofu in Japan is a revelation. So many different varieties, flavors, and textures. And recently I’ve found different flavors. Today in our fridge we have tomato, edamame, and corn tofu. We eat it at least once a day, often more than that if you include fried tofu or yuba or other variations. In the summer we eat it mostly cold, in the winter in hot pots or stir-fried. And, without doubt, most often in our morning miso soup. You, Yukari? Really? Love all the cool modern and traditional tofu in Japan. Ma po do fu is an excellent way to introduce tofu to just about anyone. Just use a firm kind of tofu. It’s really an amazing way to use small amounts of meat with another source of protein. In Japan I’ve had another excellent dish but I don’t really remember the name. You run the tofu through a sieve, then make them into patties, turn them in panko and then deep-fry. You’re thinking of a tofu croquette? Sometimes it’s made with soy milk lees (okara) leftover from pressing out the milk. Great way to cook and eat sustainably. Try making your own Silken Tofu from the book next. As Beth suggested above, eat it with soy sauce, ginger, scallions, and bonito. Or even just soy sauce. I can make a meal out of just that! DIY silken tofu is da bomb, ain’t it? Thanks for recommending my book! glad you’ve got an open mind about tofu… and i will seek out your colleague’s book. i don’t mind the stuff at all, and work demands that i use it on a somewhat regular basis. that being said, my repertoire with this ingredient is not huge, and i’d like to learn more. local “cleveland tofu” in the white tubs with green lettering is really good for most savory applications (where the tofu is a stand-in for animal protein)… much better than the brands that come in a square cardboard carton. I’d always felt the same as you about tofu, until I started trying some of the recipes on Heidi Swanson’s excellent blog (101 Cookbooks). Now every Tuesday is ‘Tofu Surprise’ night. My favorite is big chunks of tofu marinated in a sauce of pomegranate molasses, dark soy sauce, sesame oil, fresh ginger, and Sriracha, baked for about 1/2 hour on a baking sheet…tossed with hot cooked soba noodles (and the leftover marinade) with chopped cilantro, thinly sliced raw scallion, and toasted sliced almonds. OMG you’re making me hungry!! 🙂 I like good tofu. But in netherlands, its rare…..its mostly crap tofu. Still don’t make my own…yet….want to…..and soymilk and the countless soy products you can make yourself, too…. The Book of Tofu, is also very good, with lots of recipes and in depth history, and more than you ever wanted t o know!! Worth to hunt down a copy. Tofu is a lean protein, no flavor and weird, but add a little sarachi or sambal olek and you turn Sean Hannity into Bill Maher – much better. A vessel for adding flavor, especially if you fry it in oil and get it crispy. Add lemon grass, spicy, sweet, salty and savory, well it’s completley doable. Unlike Sean Hannity. Friday’s gotta be cocktail post day doggonit!!! C’mon – Barttle’s and James, vino, stale beer, anything. Just through something up there. When I was teaching at Humboldt State one summer many years ago they alway had a tofu dish. Ok, college cafeterias are hard enough without half of the dishes filled with tofu. It was about week 4 or 5 that I said ok, “Dish me up some of that tofu an chickpea curry”. Shocking it was pretty good, actually better than the turkey sandwiches I had be eating. SIDE NOTE: one of the turkey sandwiches gave me food poisoning for about three-four days so that might be one of the reasons I tried the tofu curry. Happy I did. However, tofu really needs a sauce, flavor, marinade, something. It’s pretty bad out of the package. Good post….going to work this into my life more. i love tofu, cold with some soy sauce and green onions (negi). maybe a little grated ginger. delicious! Agedashi tofu — any chilled tofu — is a summer classic. You can top it so many ways. The legendary Hunan Restaurant in San Francisco was the inspiration for a great enhancement to Ma Po Tofu — adding shrimp to the dish (the sweetness of shrimp makes a great complement to the spice and salt) — give it a try! Freshly made tofu can be so delicious it’s mind boggling. I once had home made tofu in a Japanese restaurant. It was served in broth with some shaved smoked bonito on top, and it was so sweet and delicate I couldn’t stop eating it. Storebought tofu, on the other hand, is nasty and should be avoided. I don’t think that it’s a good idea to rely on soy products for protein. Most soy these days is GMO, and who knows what the long term effects of eating GMO foods will be? Tofu should be used as a condiment or complement and not as the main source. You’re absolutely right and thank gawd there’s plenty of non-GMO and organic tofu available these days. We grow so much soy in this country and most of it is destined for feed lots and industrial uses. Why not consume at the front end of the food chain once in a while? Whenever I go to a dim sum parlor, I always keep my keenest eye out for the dumplings made with tofu skin instead of pasta. This is the highlight of my trip every time. You’re likely thinking of the dim sum of crisp tofu skin enveloping the shrimp filling? Oh my, it’s one of my faves too. Andrea you’re a true ambassador of Tofu!